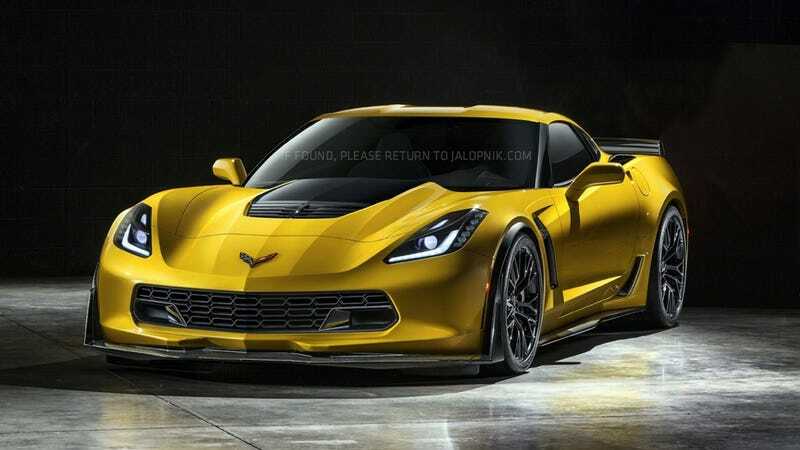 The 2015 Chevrolet Corvette Z06 is supposed to debut next week, but we've already got pictures of it right here. And it's got beautiful, powerful lines to match that beautiful, powerful engine. Reader JarrodL was the first to spot the leak, and he's already noticed some interesting details, including the paddles behind the wheel. No matter what the transmission is, with 620 horses and 650 pound-feet of torque, it's guaranteed to be fast. It looks like somebody fed a regular Corvette all the steroids in the world. Just from these shots alone, you can tell the new Corvette Z06 is going to be very aggressive, with all those new aero bits tacked on. And with a top speed hovering probably around the 200 MPH mark, it's going to need all those new bits.